The multibillion-dollar energy drink business is set to reach $61 billion in the U.S. by 2020. Most of these products are marketed directly to children and adolescents, and when combined with other drugs and alcohol, the adverse events can become even more severe. Over the last 10 years, the number of emergency room visits related to energy drink consumption has more than doubled. Energy drinks contain large amounts of caffeine, added sugars, vitamins and legal stimulants such as taurine, L-carnitine and guarana. Overall, the concern is that these vitamins, amino acids and herbals are often in higher concentrations than naturally found in food or plants, and the effects when combined especially with caffeine may be enhanced. “It’s well known in the legal industry that energy drink manufacturers know that there is a high level of caffeine in their drinks. Just like with tobacco and other similar products, at some point the manufacturer is going to have to take some responsibility,” Brad Parker says. Most energy drinks were originally classified as “dietary supplements” in order to sidestep the U.S. Food and Drug Administration (FDA)’s caffeine limits for beverages. 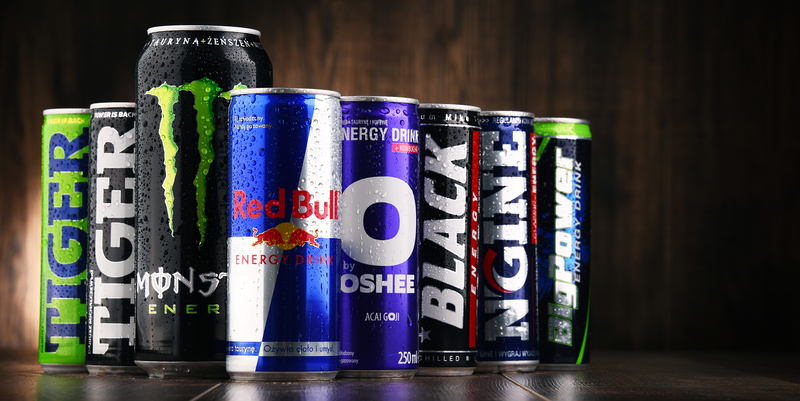 When energy drinks first came under scrutiny a few years ago, most manufacturers agreed to disclose their ingredients and add labels displaying the quantity of caffeine, sugar and other stimulants. Last year in response to the rising popularity and threat of energy drinks, the FDA issued a series of industry guidelines (see sidebar) to help dietary supplement and beverage manufacturers determine whether a liquid food product is properly classified as a dietary supplement or as a beverage and to remind the industry of legal requirements regarding the substances that may be added to either type of product. Another major concern is the popular combination of energy drinks and alcohol. The Substance Abuse and Mental Health Services Administration (SAMHSA) found that people in bars who drank alcohol mixed with energy drinks were three times more likely to get drunk and four times more likely to drive drunk (possibly because the stimulants in caffeine can mask the effects of alcohol). The greatest way to reduce the potential energy drink dangers is to become educated. Consumers need to be aware of how much caffeine is in a drink or product, and parents need to know exactly what their children are drinking and talk to them about what is safe. Energy drinks will be labeled as conventional foods/beverages and not as dietary supplements. Energy drink labels will declare the total quantity of caffeine (from all sources) in the container. Energy drink labels will not promote mixing with alcohol nor make any claims that the consumption of alcohol together with energy drinks counteracts the effects of alcohol. Energy drink labels will not promote excessive or unduly rapid consumption. Energy drink manufacturers will not market their energy drink products to children under 12 years of age. Energy drink manufacturers will not sell or market their energy drink products in K-12 schools. In addition, energy drink manufacturers will not market or sell their energy drink products at K-12 school events or activities on K-12 school premises. Energy drink manufacturers will not provide energy drink product samples or product coupons to children, nor will they provide energy drink product samples or product coupons in the immediate vicinity of K-12 schools. Energy drink manufacturers will not highlight images of children or other images featuring persons where those pictured are predominantly children on their company-managed websites. Energy drink manufacturers will not purchase advertising on television, radio or print media and, when audience data are available, Internet and mobile media, in each case where the target audience is predominantly comprised of children.